Happy 10th Anniversary Tralee Educate Together! GO TO OUR GALLERY TO LOOK AT THE PICTURES! We got a Wishing Tree to mark our 10th Anniversary. 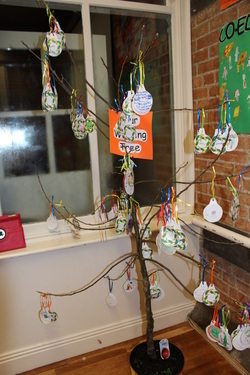 Every pupil wrote their wish for the future of the school and hung it on our Wishing Tree. The tree will be planted in the school garden this week and we hope to have red apples next summer 2013! Radio Kerry came to interview two groups at the school last week, and the interview was broadcast last Friday morning on the "Kerry Today" programme. Chris, Teresa and Francisse were interviewed as members of Start-Up Group and current Chairperson. An interview also took place with former pupils - Rose, Rían, Mistura and Ellen. Click the image to listen. Tralee Educate Together opened in 2002 and to celebrate the tenth anniversary we are extending an invitation to former pupils and staff to join us with invited guests on the 7th December at 7pm. There will also be a display of Art and written work from current pupils complied during Ethos week and based on the four principles of Educate Together. pupils in school over the past 10 years. We would like you to share your thoughts about your time at our school. We are also looking for some past pupils to read a short paragraph outlining your own thoughts about your time at Tralee Educate Together, or read memories of other children. If you wish to speak on the night, or have your memories included, please e-mail tetns10@gmail.com by 30th November 2012 marked “Attention: Jillian – Memories”. Sports Day or your favourite school event. What you did for Multi-faith & Culture Day? What you ate during Healthy Eating Week? Describe your favourite School Tour – Other School Trip – Parade. Your favourite or least favourite subjects and why? Things you did in the school garden. Describe the event you remember most. What you miss about being at school at Tralee Educate Together N.S. Note: Your stories of memories may be used during speeches or displayed during Celebrations.